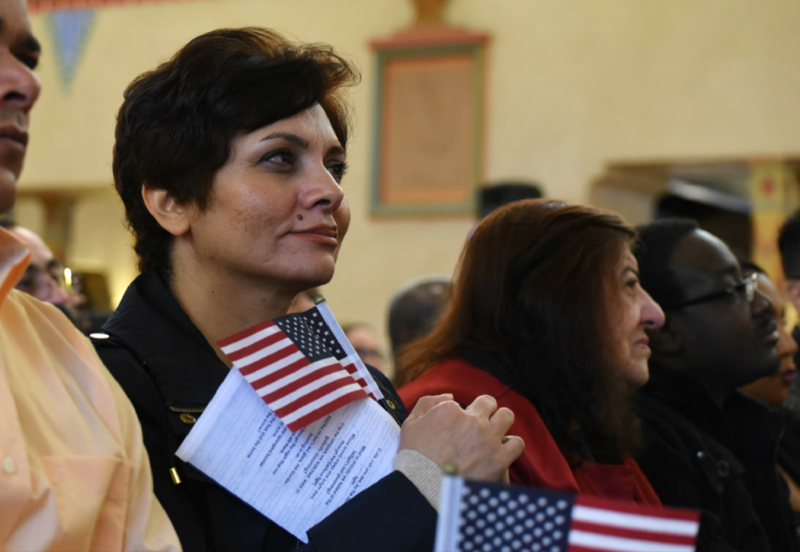 Despite the fact that immigrants living in and arriving in the United States today are not exactly receiving a warm welcome by key government institutions, a recent poll by the Cato Institute shows that immigrants’ faith in America’s key political institutions is strong. In fact, stronger than that of the native-born. General attitudes among the U.S. public towards U.S. institutions have been in decline for many years. According to Gallup , strong faith in Congress has dropped to 11 percent in 2018, down from 30 percent in 2004. Americans who have “little faith” in the presidency has risen to 40 percent in 2018 from to 20 percent in 2004. The Cato survey shows that a significantly higher percentage of immigrants express a great deal of confidence in both of these American institutions. Congress does better among immigrants with a 16 percent approval rating, compared to 7 percent among the native-born. The office of the president also enjoys more faith from immigrants at 22 percent, compared to 13 percent among the foreign-born. Asked if they are proud of America’s “fair and equal treatment of all groups in society,” responses are virtually the same between immigrants who are U.S. citizens and native-born Americans. However, a higher proportion of immigrants who aren’t U.S. citizens say they are proud America treats groups equally. Only 39 percent of immigrants agree with the statement “there are some things about America today that make me feel ashamed of America.” 69 percent of the native-born surveyed felt differently. These findings reveal that immigrants are even less critical of America than their native-born counterparts. This new CATO survey flies in the face of that thinking. It demonstrates immigrants’ pride towards America and its institutions, which should come as no surprise as they chose to live, work, and raise families here. Diana Orces is a Research Analyst at the American Immigration Council, where she focuses on research related to the effects, outcomes and results of migration. Before joining the Council, she was Assistant Professor in the Department of Political Science at Oakland University in Michigan. She also served as researcher for the Latin American Public Opinion Project (LAPOP). She has published in refereed journals such as The ANNALS of the American Academy of Political and Social Science, the Latin American Research Review, the Latin American Politics and Society and Studies in Comparative International Development. Diana holds a Ph.D. in Political Science from Vanderbilt University.